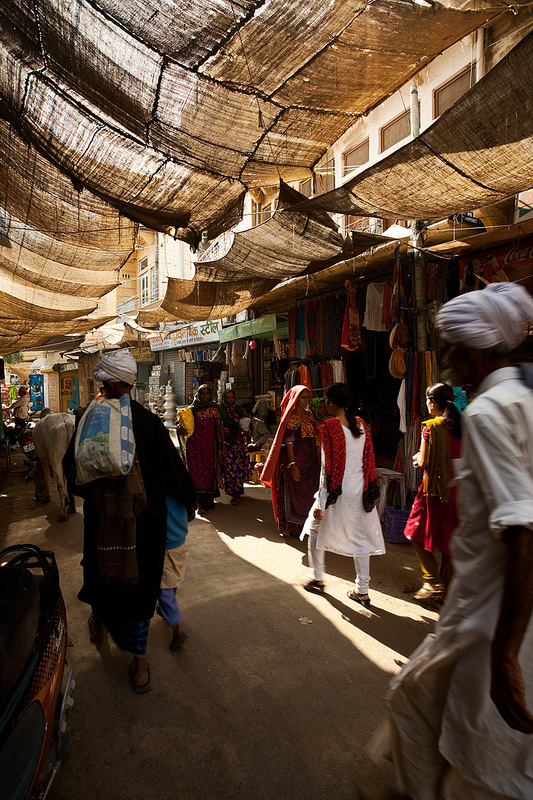 Traditionally dressed Rajasthani folk walk through Jaisalmer's bazaar. At the foot of the fort, on the main thoroughfare of Jaisalmer, I managed to grab a photo without a single tourist. Ever since I lowered my daily photo output expectation, I'm finding it easier to withstand these long waits. If I can produce one acceptable photo per day, I consider that a successful outing. Earlier, I felt a need to immediately move to the next spot whereas now, I'm quite content waiting in one place to pursue my vision. Waiting also allows me to blend into the surroundings a bit more and acclimate the locals so my presence and large camera isn't such a novelty. 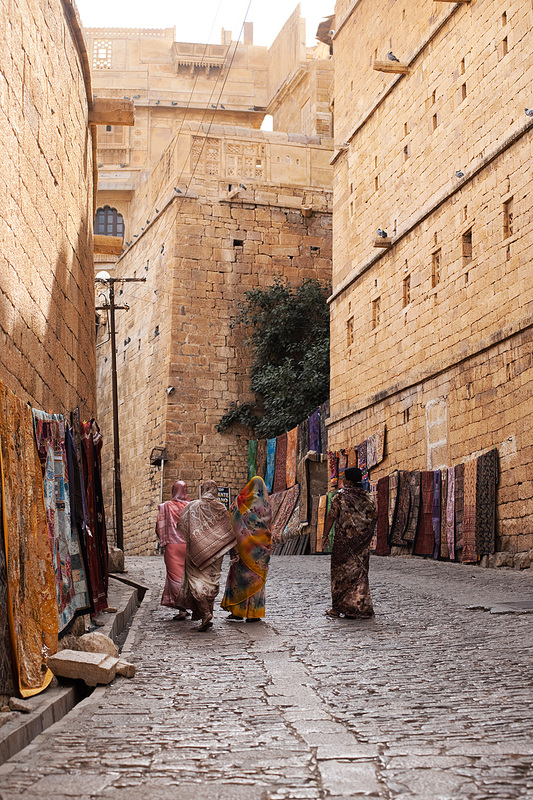 Saree-clad Indian women walk up the ramp into the entrance of Jaisalmer fort. Why is it Indian people never seem to slip and bust their buttocks on these slippery surfaces or for that matter, landmine-like patches of cow dung? Over time, these stones have been worn and polished into a smooth frictionless surface. I nearly ate it a half dozen times walking out of the fort and it got to the point where I'd question eating dinner rather than risk the possibility of accidental head trauma. how are you Pius ? when are you coming back to malaysia ? anyway enjoy your trip in Thailand Pius !!! Two beautiful shots. Your tendency not to see the cow pies may be because as a westerner your upbringing has not trained you to see them - in parts of rural India they have real economic/functional value as fuel and fertilizer and are zealously gathered, especially by children. When they are worth something you learn to see them automatically.